Mitzi & Noël sing and dance! Sir Noël, showman and epitome of the English gentleman, made a plethora of movies from the late 1950s to the late 1960s. He only turned down playing Dr. No in the James Bond spy movie. From Our Man in Havana to the Italian Job, he lent his delectable presence in costarring roles. In 1960 he went opposite Yul Brynner in the Stanley Donen comedy called Surprise Package. The big surprise is that it was written by satirist Art Buchwald, though you would never know it. Our favorite humorist seems lost in this adapted script. Apart from the delicious scenes between mobster Nico March (Yul) and the deposed and exiled King Pavel the Patient (Noël), the movie is not really funny or smart. However, every time you find Brynner and Coward in matchup mode, there is something extraordinary going on. You almost have the sense that the film was meant for someone else: perhaps James Cagney, to shoot dialogue like a machine gun. Mitzi Gaynor seems to be playing Judy Holiday. Brynner is on top of it, impressive as always. No one else in movies could have played the deadpan, throwaway lines like Noël Coward. He’s in his own movie world, like Mae West. The rest of the cast is along for the ride. Coward steals every moment on camera, like the master showman he always was. He could depose Burton and Taylor in Boom, and so going up against Yul Brynner shortly before the Magnificent Seven might have amused Noël. It’s a soufflé, for sure, and perhaps the success of Donen brought Coward in for the Greek isle locations shooting. Yul had just finished another comedy with Donen, and likely enjoyed the change of pace from epical heroes and villains. Surprise Package would be a bad TV movie nowadays with execrable actors. However, when the legends at the top of their game deign to appear in silly roles, you must pay attention. Noël Coward and Benny Hill? In the same movie? Our attention has been caught big-time in this 1969 crime caper movie, a genre all the rage in the 1960s, with epitome The Italian Job. Forget the recent remake. As if pairing those Benny and Noël was enough, you add in Rossano Brazzi and Raf Vallone as the genuine Italians—and Michael Caine as the British mastermind of a robbery in Turin, Italy, of gold bullion being driven through its narrow streets. The film is lusciously produced with all those magnificent scenes of the historic Italian city and the gorgeous Italian Alps with its twisty roads. You can figure on car chases that will outdo all those hills in San Francisco. As with classics like this, the actual production is less impressive. The stars seem self-contained in their roles. Indeed, there are no scenes with Brazzi and his fellow stars at all. The closest Benny Hill comes to Noël Coward is standing 50 feet away on a mole hill at a funeral. The glue is a boyish and charming Michael Caine, so young that when he meets Noël Coward in a lavatory, you almost feel it is salacious. Waspy Coward is a mob kingpin, believe it or don’t, who has bribed enough people to move in and out of his British prison cell with aplomb you’d expect from a sophisticated star. He runs everything with an iron fist in a dainty velvet glove. Technology, alas, is ancient here. Good heavens, Benny Hill plays a computer nerd running around with a ten-inch reel of programming. Communication is also primitive with 16mm film as the preferred mode to send text messages. Yet, the charm is delightful and timeless. Once the cars start piling up, you have a traffic jam for the pre-Euro-dollar ages. With the passing of Lauren Bacall not a few weeks ago, and with the recent live television event of Peter Pan, we were moved to a degree of nostalgia. 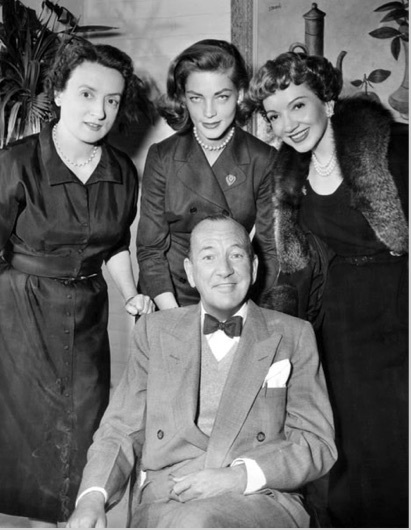 We went on a scavenger hunt to find one of the few performances by Miss Bacall that we had missed along the way: her live television role as Elvira in Blithe Spirit, a 1956 production with Claudette Colbert and Noel Coward, starring and directing his most clever and brilliant light comedy. Video Collectors of California actually had a black & white edition, rare and seldom seen, but worth every moment. To think that audiences at home decades ago had live television plays with major stars shames today’s world of hundreds of cable channels with shoddy repeats. Colbert and Bacall play the two wives of Charles Condomine, a second-rate writer who wants to do a book on charlatan mediums. Mildred Natwick reprises her 1940s Broadway stage role here as dotty, cliché ridden Madame Acarti. The result is magical. With special effects done live, and well before computer generated efforts, we have understated and perfectly fitting ghostly shenanigans. You see, Mr. Condomine’s first wife (Bacall) is dead—and returns unceremoniously to haunt his second wife (Colbert). Crossed between the full-blown movie version and stage depictions, the television version is remarkable for its medium range. It has the best of both worlds, spiritual and physical, as well as film and primitive video. Directed by the author and with his debonair send-up style, Noel Coward provides a delicious concoction. And, the television production is true to the play’s ending. If you want an unusual treat, it would pay to look for this DVD version of the Emmy-winning show from the Golden Age of Television. Wonderful and wondrous, we enjoyed every second. If you want timeless classics, you cannot find anything remotely close to a rare David Lean directed comedy, written and produced by Noel Coward. 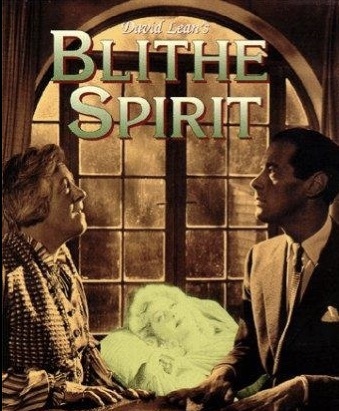 The delightful Blithe Spirit transcended its time of 1945 with lively repartee and shockingly modern sensibilities. Novelist Charles Condomine (Rex Harrison) has invited a daffy cliché-ridden medium named Madame Acarti (Margaret Rutherford) to his home to study her for “tricks of the trade” for his new book. One séance leads to another. Charles’s overly minx-like dead first wife named Elvira shows up to complicate his life and present marriage to staid Ruth. It’s one of those ironic British tales where the ultra-rich shut off lights to save electricity, but they dress four times per day for each meal with increasing foppery. Saving the best for last, Rex Harrison and Constance Cummings are dressed to the nines for dinner, just themselves of course. What a quaint era. As Elvira in ghastly grey and green makeup to make her fade into a faded color movie, Kay Hammond is utterly wonderful as the acerbic Elvira—making off-hand comments on the medium and guests with aplomb. As Madame Arcati, Margaret Rutherford made an impression on movie audiences, though her big success was still a decade away. The old gal simply steals every moment of film she shares with anyone else in the cast. That is no mean feat with Rex Harrison in his most classic glib demeanor. It’s Henry Higgins with Ruth as Colonel Pickering and Elvira as Eliza. Every moment is a classic, and David Lean deftly shows he could handle even the soufflés that Noel Coward half-baked. Short, sweet, and with a light touch on special effects, the charm is just right. The second TV movie of the year hit the small screen with all the impact of a million dollar star of yesteryear shrunk appropriately. After the Lindsay Lohan version of a woman who had a true sense of literature, who knew what film acting entailed, and had a theatrical sense about life, we now have the Helena Bonham Carter version of Elizabeth Taylor at 50. This one focuses upon her grand passion: Richard Burton (Dominic West). The stars are at a more mature point in life and were to do Noel Coward’s Private Lives. He had recommended it to them, but Taylor didn’t come up with the idea again until 1983. Coward really did have them in mind and told Taylor and Burton it was written for them in 1930 without ever having met them. Carter and West seem like they are playing a real life version of Who’s Afraid of Virginia Woolf. And, in reality that movie epitomized them—and so art imitated art imitating the Battling Burtons. Carter feared she would look like a female impersonator in Taylor costumes, but her fears were unfounded. This version makes us nostalgic again for their larger than life talents and movies. We saw them on stage in Private Lives all those many years ago, and they were magnificent—though critics disparaged them. Burton died shortly thereafter, and they never filmed a movie version of the play. This little motion picture comes about as close as one can. 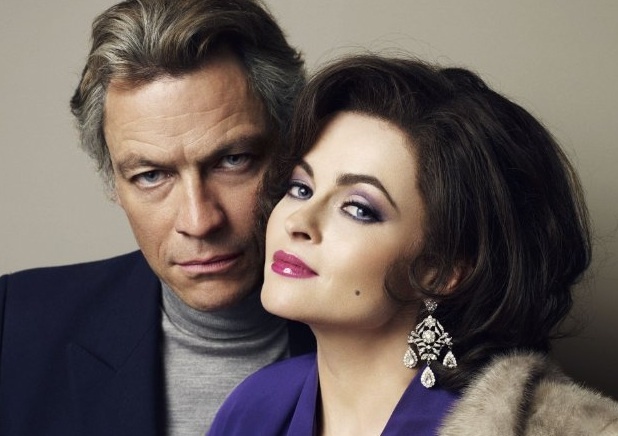 We almost wished that Carter and West simply had put on Private Lives as Burton and Taylor. The movie took us back in time and made us sentimental for the old days. It may not have that effect on younger audiences, but this is the second biographical movie we have anticipated this year (Behind the Candelabra is the other). View it as a pale shadow of the real thing and think wistfully of how the titans of that age are now gone. Burton and Taylor was a lovely trip down memory lane.